Also in the case of MITEE (see Section 7.11) the most catastrophic accident would be the total destruction of the vehicle accidentally re-entering the atmosphere after a mission. Like Rubbia's engine, MITEE is planned not to fission while in the Earth atmosphere, so that in this case too, a prompt criticality accident (explosion caused by overheating) would have less considerable consequences than the total destruction of a chemical explosion or unwanted re-entry in the atmosphere after returning from a Mars mission. The average dose commitment over the following 250 years would be about 1.6 x 10 mSv for each kilogram of uranium loaded, and for a typical MITEE configuration the average dose commitment for 250 years would therefore be about 4 x 10~7mSv [UNSCEAR, 1993; Powell et al., 1998, 1999; G. Maise, personal communication]. A key worry in planning nuclear propulsion revolves around the issue of ground testing. In the past, Kiwi and PHOEBUS were all tested at Los Alamos in the open air. The book by Dewar recounts details of those tests and the safety measures employed; it suffices to say here that no accidents involving loss of life or damage to people took place during the entire US program [Dewar, 2002, 2004]. The paper in [Dewar, 2002], for instance, documents how the effluents from the nuclear furnace test reactor were treated at LASL during the last stages of the ROVER program. Nevertheless, planning future ground tests is a definite concern. However, at least in the case of the type of reactor envisaged by C. Rubbia and investigated by the Italian Space Agency, ASI, under the Project P 242, the following considerations apply. The Rubbia engine is modular, each module being a self-standing generator of hot hydrogen gas. About 30 to 40 modules compose the engine. 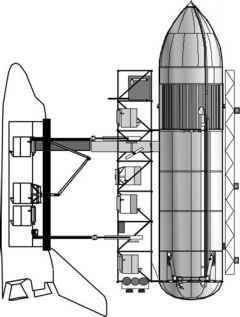 For a manned Mars mission the thrust, F, required is of order 103 N, while the specific impulse Isp is of order 2,500 s. Comparison with the NERVA thermal engine tested at Los Alamos (F = 334,000 N, Isp = 825 s, mass flow rate = 40kg/s) shows that the single module of the Rubbia engine to be tested in an appropriate test facility will process a mass flow rate of hydrogen of order 2.5 g/s. So, the scale factor between a module of the Rubbia engine and NERVA is about 16,000. The amount of hydrogen, and therefore of fission fragments deposited inside the hydrogen used as propellant, will be exceedingly small. As a consequence, testing a single module of the Rubbia engine may be performed in a closed loop, and this appears also feasible for all nuclear rockets that are of comparable thrust, and that are built following a modular philosophy, therefore also MITEE, or NEP thrusters. In fact ways of efficiently separating fission fragments from hydrogen have already been described in the Final Report of ASI on the Rubbia Engine [Augelli et al., 1999]. Closed-loop tests can be performed in any reasonably self-contained facility and building, thus ensuring that no radiation escapes.